Kingdom Hearts III (キングダムハーツIII, Kingudamu Haatsu Surii?) is an action RPG developed and published by Square Enix for the PlayStation 4 and Xbox One. It is the first Kingdom Hearts game to be featured on a Microsoft platform, having previously only released on Sony and Nintendo platforms, and the first to originally release on more than one console. 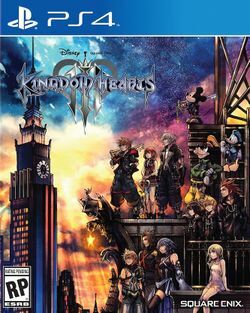 It is the twelfth installment in the Kingdom Hearts series, a sequel to Kingdom Hearts II, and the final chapter in the Dark Seeker saga. Set after the events of Kingdom Hearts 3D: Dream Drop Distance, returning protagonist Sora is joined by Donald Duck, Goofy, King Mickey and Riku in their search for the seven Guardians of Light and the "Key to Return Hearts" as they attempt to thwart the restored Xehanort's plan to bring about a second Keyblade War. Their journey has them cross paths with characters and visit worlds based on different Disney and Pixar properties. Concepts for the game began as early as 2006 after the release of Kingdom Hearts II Final Mix+ in Japan, with the game not being announced until 2013, following years of rumors and speculation. Kingdom Hearts III sees many returning gameplay features from the series, while expanding parties to five characters total, introducing new "Attraction Flow" attacks that incorporate various Disney Parks attractions, and minigames inspired by classic Walt Disney Productions Mickey Mouse cartoons in the style of 1980s LCD games. The game was built using Unreal Engine 4. Kingdom Hearts III was released worldwide in January 2019. Upon release, the game was met with generally positive reviews from critics. The game sold over 5 million copies worldwide one week after release. Following Master Xehanort's return, Yen Sid begins preparing for seven Keyblade wielders to counteract Xehanort's plan to forge the χ-blade using a reconstituted Organization XIII. Sora, who was nearly taken over by Xehanort, discovers that he has lost much of his own strength as a result. Accompanied by Donald Duck and Goofy, Sora resumes his travels across other worlds in order to regain his "power of waking", the ability to restore lost hearts. Meanwhile, Riku and King Mickey traverse the realm of darkness in search of Aqua, while Kairi and Lea train to properly wield their newly obtained Keyblades. This page was last edited on 14 February 2019, at 20:56. This page has been accessed 14,748 times.